Tyme 2 2019.4 – Effective time tracking. 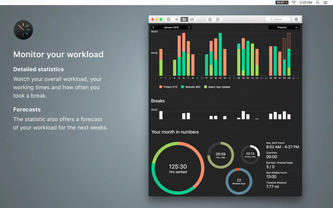 Home / Mac / Tyme 2 2019.4 – Effective time tracking. Tyme 2 is a simple and effective time tracking tool for anyone who wants to keep track of the time they have worked with. It's as clean and simple as the previous version, but with powerful new features that will make your life even easier! All in one moment – With Tyme everything you need right there. An instant overview of the times you've worked, budget, or deadlines. Quick access and autostart – Control Tyme right from the menu bar, start timers via hot keys and add notes to your time slots at any time. Tyme can also start automatically at system startup. 1; Filter your projects and tasks and move completed projects or tasks to the archive. Sort them by name, due date or own priorities. In Tyme, the project list never gets messy. Time tracking, mileage and fixed costs – Besides the tracking time, Tyme can keep track of mileage and fixed costs. Automatic mileage tracking can reduce battery life. Multiple Timers – If you need more than one active timer, start as many as you like. Extended hierarchy – Whether you just need projects and tasks or more in detail, in Tyme you can add sub-tasks and categories, as well as choose the depth of the hierarchy itself. Billing – Tyme can keep track of periods already billed. No more double billing. Statistics – Use the statistics to monitor workload, working hours, how often you paused and what your average day looks like. The statistics also provide a forecast of the workload for the next few weeks. In addition to daily, weekly, monthly, annual time frames, you can also choose custom areas. Cloud Sync – Tyme can sync your data across all your devices. Choose between iCloud or Dropbox for synchronization. Calendar Synchronization – All recorded times can be synchronized as events in your calendar. You can rearrange events in the calendar and edit notes. Tyme will sync back to your calendar. Reminder – Have you forgotten to start a timer? It's in the middle of the night, and one hour is still going? Do you have a deadline for closing in, or are you on your way to exceeding your planned budget? Tyme can remind you of these things. You do not need to configure working hours. Tyme learns habits and will remind you at just the right time. Export and Scripting – Generate time sheets as PDF, export your data as CSV or JSON to use it in other applications or use AppleScript to connect workflows of other apps. You can also export the entire database as a backup file. Various import formats – Import your data from Tyme 1, CSV files, a Tyme 2 backup file or via AppleScript. Keyboard Control – Tyme can be used without a mouse and has a hot key for almost all actions. Mobile App – With the Tyme iOS app you can track time, mileage and fixed costs on the go. It also offers geofencing – You don't have to start or stop a timer manually. Note: This application contains purchases in app and / or external module.